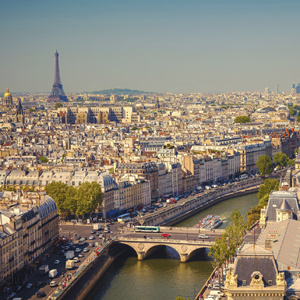 Who hasn't dreamed of studying in Paris? September 11th, 2014 will forever mark the first day of this Parisian adventure on our new campus, located in the hip 16th district! We are proud to share this new development with 84 students from 28 nationalities as they participate in three programs: the BIB, the MIB and the MSc in Fashion and Luxury Management. Our graduates were quick to answer our call for help and thanks to their enthusiasm we were able to organize a incredibly efficient welcome desk. Six graduates took up to 10 days of vacation to help the team ready the campus. They organized numerous activities to help new students discover Paris: picnics, wine and cheese tastings, restaurants and finally a sunset cruise along the "La Seine" river. This sunset cruise was the culmination of an emotional and wonderful start to the new school year. Once again, we would like to thank our united network for its support and participation. Our new campus is destined to be a privileged place to network with international companies and to leverage our GEM brand. The inauguration will take place on November 25th, 2014 and all GEM Paris Campus’ students can participate. More events, such as “Meet a Manager at GEM Paris Campus”, are planned for the future. We'll have more information for you soon.